“The Message” is one of those rare songs that wake the world up. 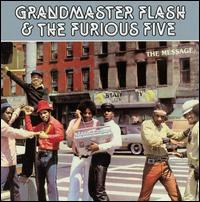 On July 1, 1982, Grandmaster Flash and the Furious Five released what would become one of the iconic songs of early hip-hop, a hit that sounds fresh and true 33 years later. Born in Barbados as Joseph Saddler, Grandmaster Flash had made a name for himself since the very earliest days of hip-hop as a groundbreaking DJ, playing parties in the same South Bronx DIY/street party scene as DJ Kool Herc, Afrika Bambaataa and other pioneers of the mid-1970s. In 1977 he began collaborating with rappers, most notably Melvin Glover (Melle Mel), the main songwriter in what became the Furious Five. The group was an immediate local success, with songs like “SuperRappin“, but “The Message” was never even supposed to be recorded. Grandmaster Flash thought that the lyrics, composed entirely by Melle Mel, were too grim, and that hip-hop was supposed to elevate its fans from the brutal realities of daily life, not reinforce them. But Sugarhill Records executive Sylvia Robinson and studio musician Bootee Fletcher sensed that the song had big commercial potential, and pushed it hard. Eventually, Flash relented, and the song became a critically acclaimed international hit. Though I assume virtually everyone has heard it before, it never hurts to give it another listen and soak in the lyrics, which are spellbinding, and very much of their time. According to some music critics, “The Message” played an important role in elevating emcees over DJs in hip-hop music. That may well have been the main cause for the fissure in Grandmaster Flash and Melle Mel’s relationship, as the two split shortly thereafter. Melle Mel later recorded “Jesse“, which may be the best presidential campaign theme song of all-time.